In this quirky urban fantasy story by Michele Lang, an army of night fae invades the small coastal town of New Castle, Connecticut…and it’s up to Ayna Cassidy, human chaos machine, to defeat them. 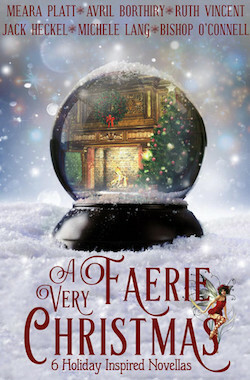 The story is included in a charming collection of holiday novellas, A Very Faerie Christmas. Join award winning, USA Today and bestselling authors for a journey into the enchanted realm of the Fae with this collection of brand new holiday stories spanning from humorous Regency and tender historical to quirky contemporary and gritty urban tales of faerie magic, human redemption, and the power of love. A #1 Amazon best seller!